What is thrombocytopenia (low platelet count)? When should I seek medical care for thrombocytopenia? Which specialties of doctors treat thrombycytopenia (low platelet count)? What is the treatment for thrombocytopenia (low platelet count)? What is the prognosis for a person with thrombocytopenia (low platelet count)? Thrombocytopenia or low platelet count is a lower than normal number of platelets (less than 150,000 platelets per microliter) in the blood. Thrombocytopenia may be inherited or acquired when conditions occur, such as the use of certain drugs. Individuals should seek medical care if they have one or more these symptoms. Doctors that may be consulted for thrombocytopenia include emergency medicine, internal medicine, hematologists, and immunologists. Diagnosis of thrombocytopenia is confirmed by blood tests that determine platelet count. Treatment of thrombocytopenia varies depending on the cause and the severity of the condition. Complications of thrombocytopenia can be severe (organ damage and death). Depending upon the cause, thrombocytopenia may be prevented. However, many causes may not be preventable. If treated early and effectively, the prognosis for thrombocytopenia is usually good. However, if diagnosed later in the disease process, or if HIT is the cause, the prognosis decreases. Thrombocytopenia is a lower than normal number of platelets (less than 150,000 platelets per microliter) in the blood. Normal platelet counts range from 150,000 to 400,000 per microliter in the blood. Platelets are one of the cellular components of the blood along with white and red blood cells. 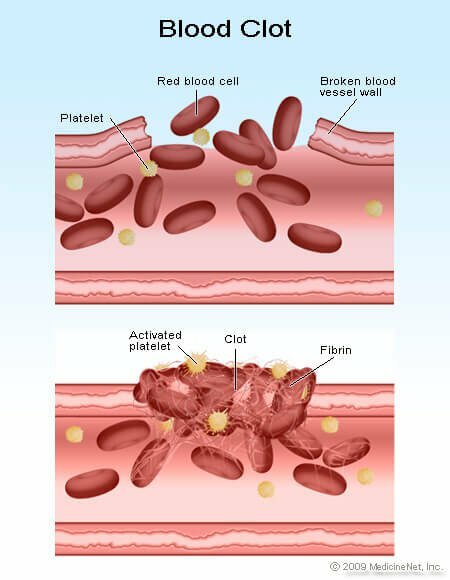 Platelets play an important role in clotting and bleeding. Platelets are made in the bone marrow similar to other cells in the blood. Platelets originate from megakaryocytes, which are large cells found in the bone marrow. The fragments of these megakaryocytes are platelets that are released into the blood stream. The circulating platelets make up about two third of the platelets that are released from the bone marrow. The other one third is typically stored (sequestered) in the spleen. Platelets, in general, have a brief lifespan in the blood (7 to 10 days), after which they are removed from circulation. The number of platelets in the blood is referred to as the platelet count and is normally between 150,000 to 400,000 per micro liter (one millionth of a liter) of blood. Platelet counts less than 150,000 are termed thrombocytopenia. A platelet count greater than 400,000 is called thrombocytosis. Platelets participate in coagulation. Platelets initiate a sequence of reactions that eventually lead to the formation of a blood clot. They circulate in the blood vessels and become activated if there is any bleeding or injury in the body. Certain chemicals are released from the injured blood vessels or other structures that signal platelets to become activated and join the other components of the system to initiate coagulation. When activated, the platelets become sticky and adhere to one another and to the blood vessel wall at the site of the injury to slow down and stop the bleeding by plugging up the damaged blood vessel or tissue (hemostasis). It is important to note even though the platelet numbers are decreased in thrombocytopenia, their function often remains completely intact. Other disorders exist that can cause impaired platelet function despite normal platelet count. A platelet count below 10,000 is severe thrombocytopenia and may result in spontaneous bleeding. In mild thrombocytopenia, there may be no adverse effects in the clotting or bleeding pathways. These effects vary with different low platelet counts from person to person. increased splenic sequestration (capturing of circulating platelets in the spleen). Some of the most common and important causes of thrombocytopenia are outlined below. Decreased platelet production is usually related to a bone marrow problem. In some of these conditions, red blood cell and white blood cell productions may also be affected. Aplastic anemia is a general term used when the bone marrow fails to produce any blood cells (red cells, white cells, and platelets), also called pancytopenia. This can be caused by some viral infections (parvovirus or HIV), medications (gold, chloramphenicol, phenytoin [Dilantin], valproate [Depakote]), or radiation, or rarely, it can be congenital (Fanconi's anemia). Chemotherapy drugs frequently cause bone marrow suppression resulting in thrombocytopenia. Some drugs other than chemotherapy can suppress platelet production, such as thiazide diuretics. Cancers of the bone marrow and blood (leukemia) or cancers of the lymph nodes (lymphoma) can cause various degrees of thrombocytopenia. Cancers from other organs can sometimes infiltrate (invade) the bone marrow and result in impaired production of platelets. Long term alcohol can cause direct toxicity of the bone marrow. Deficiency of vitamin B12 and folic acid can result in low platelet production by the bone marrow. Increased platelet destruction or consumption can be seen in a number of medical conditions. They can be divided into immune related and non-immune related causes. Heparin, a commonly used blood thinner, and similar medications [low molecular weight heparins like enoxaparin (Lovenox) can occasionally induce an immune response against platelets resulting in rapid and severe destruction of platelets. This condition is termed heparin-induced thrombocytopenia or HIT. HIT develops about 1 to 2 days in HIT type 1 and is a non-immune disorder that occurs because of the direct effect of heparin platelet activation. However, HIT type 2 is an immune mediated disorder that occurs about 4 to10 days after exposure to heparin and can develop into life- and limb-threatening complications. HIT is usually not marked by bleeding problems, but by DVT and pulmonary embolism. Diagnosis is based on clinical findings and supported by laboratory findings such as 30% drop platelet count acute thrombotic event like DVT, presence of heparin-PF4 antibodies and the resolution of thrombocytopenia after stopping heparin. Guidelines for treating HIT are too detailed to cover in this article, but can be found in reference 2. Idiopathic thrombocytopenic purpura (ITP) is a condition where the immune system attacks platelets. In severe conditions, ITP can result in very low platelet counts. In adults, this is often a chronic (long standing) condition, whereas, in children, it can be caused acutely after a viral infection. This is usually a diagnosis of exclusion, meaning other causes need to be ruled out. Some rheumatologic conditions, such as systemic lupus erythematosus (SLE) or other autoimmune conditions (connective tissue diseases), can cause platelet destruction. Transfusion of blood products and organ transplantation can sometimes cause immunologic disturbances resulting in thrombocytopenia. Thrombotic thrombocytopenic purpura (TTP) and hemolytic uremic syndrome (HUS) are related conditions that can cause non-immune consumptive thrombocytopenia resulting from some infection bacteria in the blood), pregnancy, some metastatic cancers, or chemotherapy. Other manifestations of these conditions include kidney insufficiency, confusion, anemia (hemolytic), and fever. Classic HUS is largely seen in children and is generally thought of as an aftermath of an infection with a certain strain of Escherichia coli bacteria (E. coli O157:H7) which causes infectious diarrhea. HELLP syndrome (hemolysis, elevated liver tests, low platelets) is another non-immune thrombocytopenia that may occur during pregnancy and can include elevation of liver enzymes and anemia (specifically, hemolytic anemia or rupturing of red blood cells). Disseminated intravascular coagulopathy (DIC) is a rare but severe condition that may be a complication of overwhelming infections, traumas, burns, or pregnancy. Injury to or inflammation of blood vessels (vasculitis) and, sometimes, artificial heart valves can cause increased destruction of platelets. Severe infections (sepsis) or trauma can sometimes cause consumptive thrombocytopenia (without DIC). Splenic sequestration can also lead to low platelet counts as a result of enlargement or change in function of the spleen for a variety of reasons. When the spleen enlarges, it can retain (sequester) more than the usual amount of platelets. Common causes of thrombocytopenia due to splenic enlargement may include advanced liver disease with portal hypertension (cirrhosis, for example, from chronic hepatitis B or C) and blood cancers (leukemias or lymphomas). Dilutional thrombocytopenia can result from severe bleeding and transfusion of several units transfused red blood cells in a short time. Pseudothrombocytopenia (false thrombocytopenia) is a commonly encountered condition where the number of platelets seen on a complete blood count analysis (CBC) may falsely appear low because of the clumping of platelets together. This can lead to an artificially reduced automated count. If this is suspected, the blood can be redrawn in a tube with a material that prevents clumping of platelets for repeat analysis. A peripheral smear review will identify platelet clumping. Thrombocytopenia can also be present at birth, called neonatal thrombocytopenia. Most of these cases can be caused by processes similar to those above, although, they are occasionally related to rare genetic conditions. If thrombocytopenia is detected on a routine blood work, it is generally addressed and investigated by the physician who orders the test. In people with known thrombocytopenia, follow-up care is decided based on the diagnosis and the severity. However, if a person has one or more of the above listed symptoms, they should seek a health-care professional as thrombocytopenia may quickly worsen and become serious in some individuals. People with thrombocytopenia are, in general, initially cared for by an internist or a family practice physician. Sometimes, consultation with a doctor who specializes in blood disorders (hematologist) is helpful for more thorough investigation or treatment, but others may require additional help. Although some primary care doctors and pediatricians can treat thrombocytopenia, other specialists such as emergency medicine, hematologists, internal medicine, critical care and immunologists may be needed to treat and diagnose the problem or its underlying cause. Thrombocytopenia is usually detected incidentally from routine blood work done for other reasons. Platelets are a component of the complete blood count (CBC) which also contains information on red blood cells and white blood cells. If thrombocytopenia is seen for the first time, it is prudent to repeat the complete blood count in order to exclude pseudothrombocytopenia (see above). If the repeat CBC confirms low platelet counts, then further evaluation can begin. Once detected, the cause of thrombocytopenia may be investigated by the doctor. The most essential part of this evaluation includes a thorough physical examination and medical history of the patient. In the medical history, the complete list of all medications is routinely reviewed. Some of the other important components of the history include reviewing previous known history of low platelet count, family history of thrombocytopenia, recent infections, any previous cancers, other autoimmune disorders, or liver disease. A review of the symptoms related to excessive bleeding or bruising can also provide additional information. As a part of a thorough physical examination, special attention may be given to the skin and mucus membrane in the oral cavity for petechiae or purpura or other signs of bleeding. On the abdominal examination, an enlarged spleen (splenomegaly) can provide important diagnostic clues. The urgency to perform additional testing and evaluation is largely dependent on how low the platelet count is on the blood count, and what the clinical situation may be. For instance, in a person who needs a surgery and has a platelet count of less than 50,000, the investigation will take precedence over one whose thrombocytopenia was detected on a yearly blood work with a platelet of 100,000. A comprehensive review of the other components of the CBC is one of the most important steps in the evaluation of low platelet count. The CBC can tell us whether other blood disorders may be present, such as, anemia (low red cell count or hemoglobin), erythrocytosis (high red blood cell count or hemoglobin), leukopenia (low white cells count), or leukocytosis (elevated white blood cell count). These abnormalities may suggest bone marrow problems as the potential cause of thrombocytopenia. Abnormally shaped or ruptured red cells (schistocytes) seen on the blood smear may suggest evidence of HELLP, TTP, or HUS (see above). Another clue in the CBC is the mean platelet volume or MPV, which is an estimate of the average size of platelets in the blood. A low MPV number may suggest a platelet production problem, whereas, a high number may indicate increased destruction. It is important to also review other blood work including the complete metabolic panel, coagulation panel, and urinalysis. Certain abnormalities in these tests can suggest advanced liver disease (cirrhosis), kidney problems (renal failure), or other pertinent underlying medical conditions. In some causes of thrombocytopenia, such as HIT or ITP, additional testing with antibodies may be useful. Bone marrow biopsy may sometimes be performed if a bone marrow problem is suspected. The treatment of thrombocytopenia is largely dependent upon the cause and the severity of the condition. Some situations may require specific or emergent treatments, whereas, others need only be managed by occasional blood draws and monitoring of the platelet levels. In auto-immune thrombocytopenia or ITP, steroids can be used to suppress the immune system in order to impair the destruction of platelets. In more severe cases, intravenous immunoglobulins (IVIG) or monoclonal antibodies may also be given to alter the immune process. In refractory cases, splenectomy (removal of the spleen) may be necessary. If a drug is thought to be the cause of a low platelet count, then it may be discontinued by the supervising physician. In patients with HIT, it is very important to remove and limit the future use of any heparin products, including low molecular weight heparin (like Lovenox), immediately to prevent further immune response against the platelets. If TTP or HUS is diagnosed, the treatment may include plasma exchange, plasmapheresis, or eculizumab. In cases with severe kidney failure, dialysis may be necessary. In general, platelet transfusion is not necessary, unless an individual with low platelets (less than 50,000) has an active bleeding or hemorrhage, or needs a surgery or other invasive procedures. Frequently, a platelet transfusion may be recommended without any bleeding if the count is less than 10,000. In suspected cases of HIT or TTP, transfusion of platelets may not be recommended because the new platelets could potentially make the condition worse and more prolonged. Other complications may be related to any other underlying factors or conditions. For example, autoimmune thrombocytopenia related to lupus may be associated with other complications of lupus. TTP or HUS can have many complications including severe anemia, confusion or other neurologic changes, or kidney failure. HIT or heparin induced thrombocytopenia can have devastating complications related to blood clot formation (thrombosis). The mortality rate for HIT is about 20% to 30%, according to a 2016 study. In general, thrombocytopenia can be prevented if the cause is known and it is preventable. For example, if a certain medication is found to induce a low platelet count in an individual, then its future use needs to be avoided. Alcohol avoidance should be encouraged in people with known alcohol-induced thrombocytopenia. Current and future use of all heparin products must be avoided in people diagnosed with heparin-induced thrombocytopenia. The prognosis for someone with thrombocytopenia depends on the cause and the severity of the disease. Generally, when thrombocytopenia is diagnosed early, the outcomes are very good. However, delayed diagnosis can result in problems ranging from heart attack, organ damage (for examples, spleen, bowel, kidney) to pulmonary embolism, each of which has a more guarded prognosis. HIT, as previously mentioned, is serious and still has a mortality rate.